The outdoor plaza has a stage with lighting and electricity. Bathrooms are available inside the annex and the main library. After hours only the Annex will be available. Reservations are required to use the rooms. Check availability and make reservations at (317) 398-7002. *Disclosure: The plaza is in a trafficked area of library property. Although areas can be zoned off, side doors to the main library and annex must remain open to the general public. Foot traffic around these entries should be anticipated during library hours. These meeting rooms are located in the Carnegie East Wing (next to the main library). The legal capacity is 90 people in the rooms without furniture, though we have found that they seat 35-40 people (with furniture) comfortably. This meeting room is located in the lower level of the main library. Please note that this room is not enclosed; therefore, there is not a way to block noise from visitors of the library. Staff members also sometimes have to pass through this area to use the kitchenette. We recommend renting a room in the library's annex, the Carnegie East Wing, if you want privacy during your event. 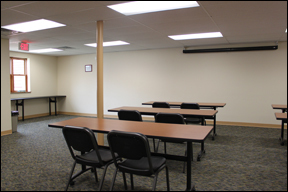 This meeting room is located in the library's Morristown Branch. Reservations are required to use the rooms. Check availability and make reservations at (765) 818-1718. *If a not-for-profit group is charging for an event that is held at the library, they will be charged the “for-profit” fee of $40.00 for up to 4 hours. For use beyond 4 hours, there will be an additional $20.00 charge.